Within these the name Sophia appears in successive generations — not a common name in Scotland but it does help us track successive generations. The deaths of several small children are noted and from other records we have found out the causes of their death. Poignantly in Carsphairn Kirkyard there is the following sad epitaph. Jesus said Suffer little children to come unto me and forbid them not as such is the Kingdom of Heaven." 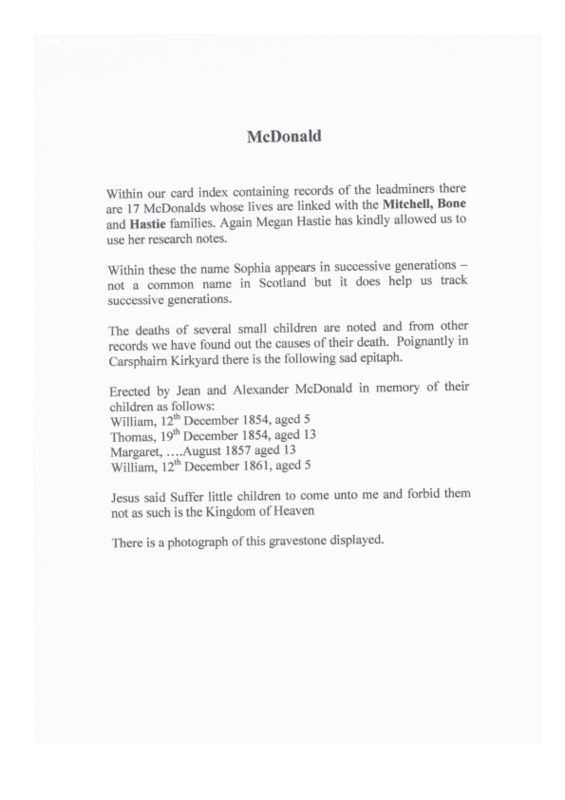 IS, “McDonald Family History,” Carsphairn Archive, accessed April 22, 2019, http://carsphairn.org/CarsphairnArchive/items/show/81.